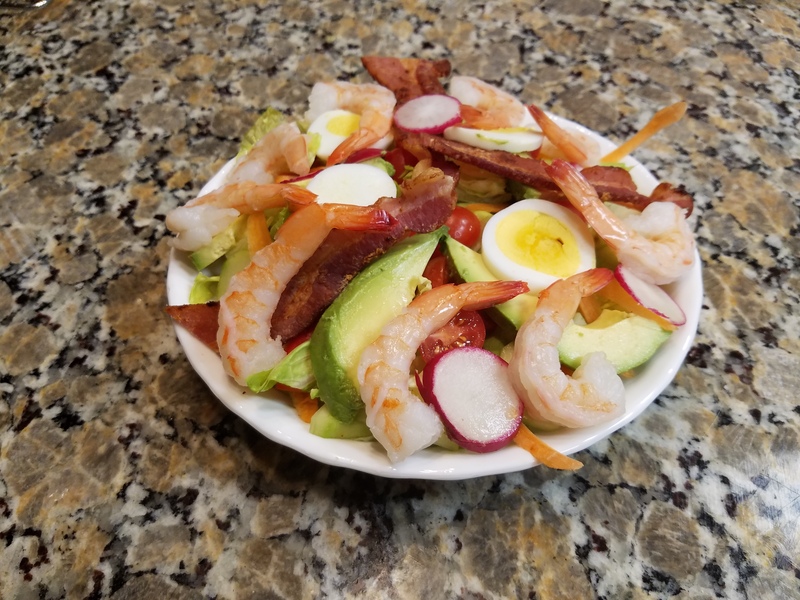 Shrimp salads are always a hit in our house, and what a easy dish to make. Prep time is short. Satisfaction is the best. Start with good clean and fresh ingredients, crisp lettuce will make the salad stand out. Wash all of your vegetables and let them dry a little, pat dry if needed on the lettuces or use a spinner. If you have an egg slicer use it, eggs that are cut evenly will look extra nice in your dish. Use a large bowl and place a mixture of the two lettuces and arrange them nicely. Place the other ingredients around in the bowl to make a pretty looking dish. When you’re placing the shrimp on make the tails all point in the same direction, it is a eye catcher. I put them on last too. As far as salad dressing everyone has their own preferences. Blue Cheese is nice but can be a bit heavy so let everyone use the amount that they prefer. This looks delicious! I love the 3 kinds of protein,​ and the avocados for color & texture.